New product for retail trade! In addition to our long-standing commitment to ethically sourced, quality tea, we've been making changes to offer more sustainable packaging options and our Tea Caddies are the perfect plastic-free option to help customers buy and store their favourite teas. 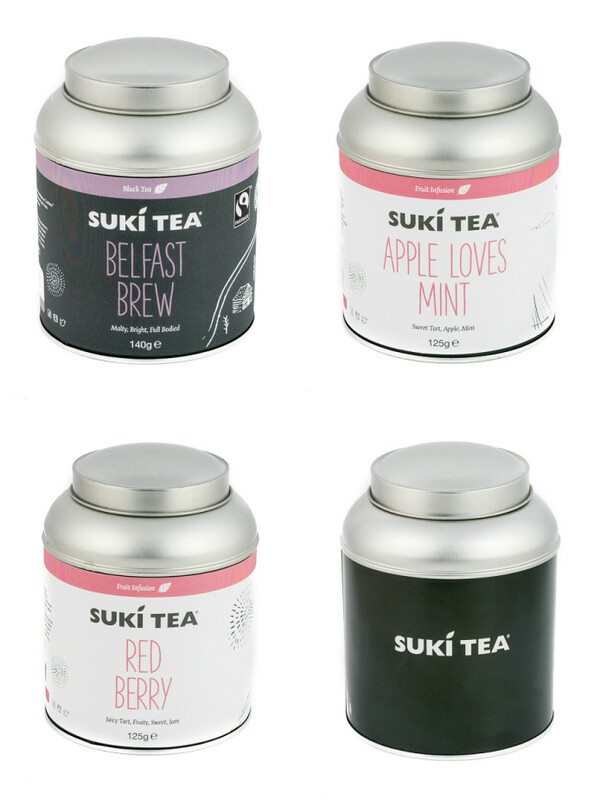 We've selected 3 of our best-selling teas (Belfast Brew, Apple Loves Mint and Red Berry) and packed each in a functional, stylish and airtight tin caddy, keeping your customers tea looking and tasting great. And with a larger than usual capacity we've been able to pack even more of everyone's favourite blends in! 140g of Belfast Brew (normally 100g) and 125g of Apple Loves Mint and Red Berry (normally 80g). Under the labels, all the tea caddies feature our iconic Suki Tea sketches, a special keepsake that customers can refill again and again. There's even the option to stock our unfilled caddies so you can encourage your customers to choose their own tea to fill it with. A gorgeous gift or special treat to take pride of place on any kitchen worktop! *All caddies must be bought in packs of 6 but can be mixed and matched across the range.